The round setting with a sterling horizon line separates an Amazonite "sky" from your choice of sand. Whether it was a childhood trip, where he proposed, where you spent your honeymoon or a summer abroad, Dune Jewelry captures those memories from where you've been and where you love. One Sterling Silver Necklace, Matte Finish Pendant. Horizon Theme, Top Half Amazonite Blue Setting. Bottom Half is Inlaid with Your Chosen Sand. Adjustable Chain - Wear at 16", 18" or 20". Nautical Flair, Horizon Inspired Pendant Setting. Approximately 14.5mm in diameter, well smaller than a dime. Dune Jewelry Horizon Necklace is a hand delivered gift. These gifts are delivered by one of our local design centers located throughout the United States and Canada. Same day delivery is available for most gifts when ordered before the cutoff time. The cutoff time for Dune Jewelry Horizon Necklace is in the recipient's time zone. 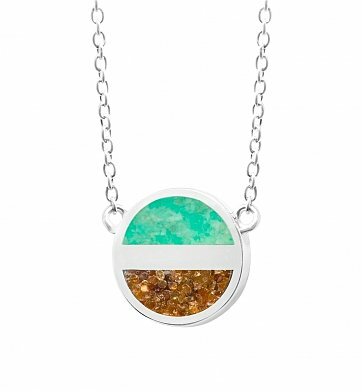 Horizon-themed pendant with Amazonite sky on top, your chosen sand on bottom. A one-of-a-kind creation, made in the USA by Dune Jewelry, Massachusetts.